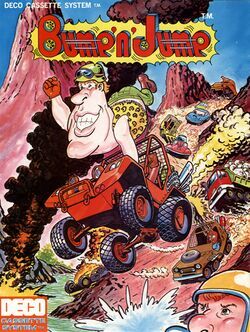 Bump 'n' Jump is a game developed by Data East, and was first released in the arcade in 1982 (licensed to Bally/Midway). The game was released as Burnin' Rubber worldwide. The game has been ported to the Atari 2600 and Intellivision in 1983, and the ColecoVision 1984. Unofficial conversions of the game have also appeared on the Commodore 64. The goal in this game is to drive from the beginning of a level to the end while bumping enemy vehicles into obstacles and jumping over various large obstacles such as overpasses, and large rivers. Due to the bird's eye view, players cannot see the large obstacles until it is too late to jump, so the game displays a flashing exclamation point when the large obstacles are about to appear. The enemy vehicles are separated into cars and trucks. Cars can be bumped into obstacles or jumped upon and destroyed, while trucks cannot be bumped; they can be jumped upon only to destroy them, and will sometimes drop obstacles that will destroy the player. At the end of each level players receive bonus points for the remaining gasoline in their car, and the number of enemy vehicles crashed. If, however, the player completes a level without bumping another car, the player receives a huge point bonus. Going from one level to another is characterized by a change of seasons. Apart from the change of scenery, the winter scenario also features the additional challenge of slippery roads. In 1986, an updated (or arranged) version of the game was developed for the Famicom and titled Buggy Popper. The basic story behind this game is that the players' girlfriend has been kidnapped, and you must race to her rescue. Adding a level of complexity, the NES version of the game also requires that players pick up cans of gasoline that are interspersed throughout each course, as their car uses up fuel steadily throughout the game. It was later published for the Nintendo Entertainment System by Vic Tokai in 1988. This page was last edited on 29 November 2008, at 03:29. This page has been accessed 21,043 times.